Death Stranding is like that best friend who suddenly got into post-modern poetry during college, and only speaks in iambic riddles when you make even the simplest of requests ("Tea or coffee, Eric? It's a simple yes/no question!"). Creator Hideo Kojima is remaining as cryptic as ever when it comes to marketing the open world game, using only grand metaphor and abstract concepts to describe his latest project beyond the specific details we already know so far. But that could be about to change. The developer is set to appear at a Tribeca Film Festival panel next month alongside the game's lead actor Norman Reedus (The Walking Dead season 9) and host Geoff Keighley, where they will apparently discuss "pushing the boundaries of the video game medium and their latest collaboration." Of course, the pair could be as elusive and non-descript as ever during the panel, which takes place at a yet to be disclosed time between April 24 and May 5, but the fact Tribeca's own synopsis of the talk admits that "speculation from fans and industry alike have created a deafening excitement" suggests concrete details could be revealed from the horse's mouth. 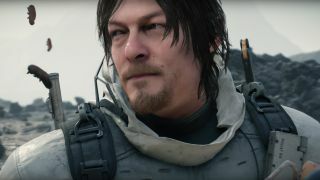 Death Stranding is one of many big new games of 2019 on the way this year and beyond. Find out more by clicking the link or watching the video below!